thanks to sister Waliya Inayat who enabled me to help out in the Shebi Arus event (though not much help was needed, everything was well arranged by people of the Mevlevi Order of America and other hard working organizers), i had a rare chance of having a glimpse of the careful preparation of the stage for the sema (the sufi whirling dance worship), the rehersal of the dervishes and the behind the scenes of a sema. it was beautiful to see Effendi Posteshin Jelaluddin Loras to not only orchestrating the precise movements of the sema to the dervishes but also reminding them the spiritual significance of them during the time of rehearsal. i particularly remember as he was correcting the angle of bow of dervishes he was telling, when you bow, bow as if you are sacrificing your head. head and mind create confusion. you are replacing mind with heart by bowing down the head towards the heart. at the same time you are bowing to the highest of the other. you are bringing the hightest of other into your heart. it was really something to hear that from the effendi. one of the most beautiful thing about the night's program was that of inter-faith recital of Rumi's poem. The poem was recited in original farsi, followed by different section recited by representative of native community, by christian father, rabbi, buddhist monk and muslim. it blended very well with the universal appeal of rumi's message that transcends the boundaries of religion and has always been such a powerful source of inspiration for inter-faith work and dialogue. there was beautiful ilahis performed by musicians from turkey which was so sweet to hear. and finally was the sema performance which was enchanting. 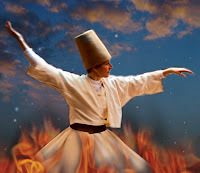 even those who didnt have much background about rumi or his thoughts could not help but immersed into the other-worldly beauty and charm of the whirling. another beautiful aspect of last nights program was the opportunity of meeting so many beautiful hearts. apart from seeing my own friends i also came across people who live for the highest. i was surprised when found that fellow blogger, Freida could recognize me so easily among so many people. it was really joyful meeting and talking to her. wish we had more time! finally a lot of credit goes to organizers who did put a lot of effort in co-ordinating it and sister Waliya did a marvelous job in the final production! language barrier | although music and dance has its own superiority to dissolve the boundaries of language or culture, but when it comes to songs, recitation and the message of it; without the understanding of the language - majority of it remain untouched. during the main sema i felt it because if i had proficiency in turkish or persian, i am sure the inner experience would be much much richer. i wish there could be a giant screen which could project the meanings of the recitation which is said during the whirling. it surely could have a much wider effect on the level of hearts when it comes to connecting it to the meanings of the performance. * will post more sharing, pictures behind the scene and also from the event later, inshallah. peace!